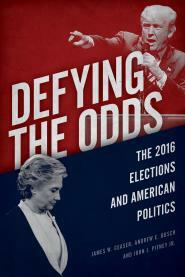 In Defying the Odds, we discuss demographic gaps in the 2016 election. U.S. Sen. Cindy Hyde-Smith attended and graduated from a segregation academy that were set up so that white parents could avoid having to send their children to schools with black students, a yearbook reveals. Needless to say, people like the Noose Lady make it hard for the GOP to reach out to African Americans. And the GOP has been failing at outreach for decades. The timing couldn't have been more awkward. Ronna Romney McDaniel, chairwoman of the Republican National Committee, came to Detroit on Monday to try to reach out and and attract African-American voters to the GOP. But her visit came 48 hours after a violent and deadly weekend of rioting in Charlottesville, Va., where white supremacists and neo-Nazis gathered to protest the removal of a statute of Confederate Gen. Robert E. Lee. Their confrontations with protesters of their movement culminated with an Ohio man driving his car through a crowd of protesters, killing a woman and injuring 34 others. Unlike many politicians in both the Republican and Democratic parties who condemned the violence and the white supremacists who sparked it, President Donald Trump denounced the violence from "many sides" and refused to call out the white nationalists by name. Reeling from back-to-back presidential losses and struggling to cope with the country’s changing racial and ethnic makeup, the Republican National Committee plans to spend $10 million this year to send hundreds of party workers into Hispanic, black and Asian communities to promote its brand among voters who overwhelmingly supported Democrats in 2012. As noted on the Besstte Pitney blog, RNC has made repeatedly made similar efforts for more than thirty years. Ed Gillespie, chairman of the Republican National Committee, said increasing his party's share of the black vote is "a top, top priority." The party is looking into establishing chapters at historically black colleges and universities, he said. Gillespie recalled Maryland Lt. Gov. Michael S. Steele (R) telling him that the GOP should target black voters between 18 and 35 "because they are most likely to not identify as Democrats." During a trip to Pittsburgh in July, Gillespie said, he met with Marc H. Morial, the new president of the National Urban League. While in Detroit last month, Gillespie said, he talked for two hours with editors at the Michigan Chronicle, one of the nation's few black daily newspapers. The party has arranged with American Urban Radio to broadcast a weekly message to the huge African American audience the network reaches. Gillespie declined to specify how much the party will spend, saying he did not want the Democratic leadership to know. "But we're budgeting for it," he said. Saying they want to bring "two-party democracy" to the Latino community, Republican leaders at their winter meeting in San Jose on Thursday announced a $10 million nationwide ad campaign to boost the GOP's image with the fast-growing, but largely Democratic, electorate. To tailor its effort -- which will include extensive advertising in English and Spanish in California -- the Republican National Committee released a few results from a 1,000-person nationwide poll that they say shows about a quarter of likely Latino voters have no deep ties to Republicans or Democrats. "They are up for grabs," RNC Chairman Jim Nicholson said at a press conference, surrounded by Latino politicians, state party leaders and media consultants. On Tuesday (9/16), for instance, the party will announce its latest minority outreach program, the first serious effort at attracting minorities to the GOP since the short chairmanship of the late Lee Atwater. The GOP with an obvious eye toward the 1998, and even 2000 election campaigns plans to spend $ 1.2 million over the next year to promote its ''New Majority Council,'' which will be charged not only with recruiting minority candidates but also with getting the GOP message out to minority groups. More importantly, and in contrast to Atwater's largely rhetorical ''Big Tent'' efforts, the ''New Majority Council'' will become an institution within the Republican National Committee (RNC) under the direction of party co-chair Pat Harrison. ''We're going to take this a step beyond anything that Lee tried to do,'' said Levy. On Tuesday night, an all-star cast - including Senate Majority Leader Trent Lott (Miss), House Speaker Newt Gingrich (Ga), Republican National Committee Chairman Jim Nicholson, and National Republican Congressional Committee Chairman John Linder (Ga) - turned out for a fundraiser sponsored by Americans for a Brighter Future, a PAC aimed at recruiting minority Republican candidates. Our goals are very simple," said Raynard Jackson, the founder and head of the group who has long been active in GOP circles, working for Sen. Kit Bond (Mo) and ex-Sen. John Danforth (Mo), with whom he helped push the nomination of conservative Supreme Court Justice Clarence Thomas. "To get more minorities elected and interested in the Republican party." "The party has demonstrated that they are very serious about minority outreach and I am convinced that we're going to take that message into 1998 and 2000," Jackson added. "I guarantee you that we'll see a browning of the Republican party." Besides the turnout at the event on Tuesday, NRCC Chairman Linder said the committee, with the help of Hispanic Republican Rep. Henry Bonilla (Texas) and Watts, is paying greater attention to minority recruitment this cycle. "We're emphasizing minority outreach more than we ever have before," said Linder. And on a national level, RNC chair Nicholson and co-chair Pat Harrison are also intent on expanding minority participation in the "big tent" party. "We both share the strong goal (that) we want to make this party more inclusive," said Nicholson in a recent interview, adding that the RNC will soon be sending out newsletters in Spanish. "Republicans don't have to abandon our principles to reach out to minorities. We have only to rediscover them," [Rep. J.C.] Watts told "Project Pioneer," a candidate seminar sponsored by the Republican National Committee. The event's name denotes a new frontier for a party that has either ignored or been rejected by the black community for 30 years. It also reflects a renewed strategy by RNC Chairman Haley Barbour to follow the "big tent" game plan started by the late Lee Atwater in the late 1980s. "We Republicans have made a terrible mistake over the years in not aggressively seeking the millions of black voters who agree with us on the issues," said Barbour, who argues that there is now a pool of conservative blacks willing to consider the GOP. We're also going to work outreach very hard, the minority votes, in 1992. My personal impression is that -- and there are a good number of minority folks represented in the room here today. My personal impression is that minorities are becoming increasingly disillusioned with the Democrats who simply promise them things and never ever come through with anything in the real world. It is apparent that the jobs that have been generated for minorities in the last decade or so come because of Republican administrations and Republican policies, not Democratic administrations -- because there weren't any -- and not Democratic policies. And we need to make sure that's understood. Republican efforts to attract more minority voters have shifted into higher gear heading toward the 1990 elections. GOP National Committee Chairman Lee Atwater has been wooing Asians, Hispanics and blacks in San Francisco, Los Angeles and San Diego. Atwater met with state Republican leaders Friday in Newport Beach, Calif., urging them to make reaching out to minorities a priority. President Bush, encouraged by polls that show his support among blacks higher than predecessor Ronald Reagan's, will speak at the May 13 commencement of predominantly black Alcorn State University in Mississippi. Alcorn State President Walter Washington said he's invited every president since Lyndon Johnson; Bush is the first to accept. ''Even a small increase in minority votes (for Republicans) will make the difference between victory and defeat in many elections,'' Atwater told the GOP officials. [RNC Chairman Lee] Atwater's mentor, Sen. Strom Thurmond (R-S.C.), was a symbol and beneficiary of the white backlash that drove millions, including Thurmond, out of the Democratic Party and into the GOP. But now, Atwater said in an interview, "minority outreach is my command focus, and I'm going to insist it drive my daily schedule." Through appointments to administration jobs and party posts, Atwater hopes to spur the creation of "an alternative leadership structure" in black communities. "Affirmative action has worked, and there's now a much larger black middle class," he said. Pointing to surveys showing weaker Democratic identification among young, better-educated blacks, Atwater said, "The time is right for us to reach out to them." Unstated by Atwater but acknowledged by other GOP operatives is the fact that the "outreach" strategy could not have worked with Ronald Reagan in the White House and the Justice Department leading the battle against civil rights rulings obtained under previous Democratic administrations. ''No subject is more critical to the future of our party than minority participation,'' Fahrenkopf told the summer meeting of the Republican National Committee. The RNC created an advisory commission on minority participation to study the problem. Historically, the Republican Party has done poorly among black voters. President Reagan got only 9 percent of the black vote in 1984. Fahrenkopf named Edward Lujan, chairman of the Republican Party in New Mexico, to head the commission. ''The purpose of the commission is to make recommendations to the RNC chairman with the goal of taking steps to attract more minority commmunities into our party's activities,'' Faharenkopf said. It appears to be the Mission Impossible of the 1982 campaign, but Richard N. Richards, chairman of the Republican National Committee, is pulling no punches. "It's very important we elect one or more black Republicans to the House this year," he said in an interview. "I'm very confident we will." In light of the Reagan Administration's repeated gaffes on civil rights issues and the high unemployment rate among blacks, Richards's goal may seem especially improbable. But the GOP already has two apparently strong candidates for November, and several others are possible. "We have to be concerned," said a Democratic political aide. No black Republican has served in the House since 1928. In recent years, the national party has trumpeted its "outreach" efforts to expand the party's racial base. But Richards concedes those efforts have failed and says the way to succeed is to elect some black Republicans who can symbolize efforts to expand black trust in the GOP "I can't do that on my own," Richards said, adding, however, that things could change once Republicans make blacks feel comfortable within the party. With black unemployment rising at a rate about double the national average, inner cities eroding and President Carter cutting social programs, Republican Party leaders hope this year to make inroads into the traditionally Democratic black vote. ''There's a lot of opportunity there,'' said Bill Brock, the Republican national chairman. Republicans hoped to make it a symbol of a new commitment to older cities, to blue-collar workers and minority groups. In their preconvention deliberations, the Republicans unanimously adopted a new platform plank on black Americans for the first time in modern history. The plank urged Federal programs for the inner cities, strong enforcement of civil rights statutes, and a nondiscriminatory system of Federal appointments. The plank was the work of Ronald Reagan's political strategists, who say that he will address the concerns of black Americans from a conservative viewpoint. Bob Dole meant to win black friends with his conciliatory speech to the National Urban League last week, but he committed a gaffe that undid his mea culpas. "We may have gotten what we deserved in terms of the black vote in 1976," the Republican Vice Presidential candidate began. ". . . I'll confess we haven't done enough. I promise we'll do more. We can't run with Lincoln any more." Unfortunately, Dole's speech didn't end there. "Vernon [Jordon] said he was sending a warning to both parties," the Kansas senator declared. "We got ours. We got ours in spades." There was an audible ripple of groans. "That's not offensive to me," Dole said later. "In the Midwest that means we were clobbered . . . I don't think it's anything at all unless somebody makes something of it."